The Burton Men's Covert Pant offers the dependability and style of Burton's famed britches at an affordable price point, so you can spend your hard-earned cash money on things that actually matterâ€”like burritos. Burton incorporated everything you need to keep comfortable on the mountain in these shred-ready pants, starting with a DryRide Durashell membrane that keeps you dry while you're surfing wind-buffed powder bowls, and fully taped seams that keep all the cracks secure against heat-robbing moisture. After working up a sweat ripping park laps or jibbing natural features on the back mountain, the two mesh-lined ventilation zips let you ditch the heat in a hurry so you don't get your undies in a lather. 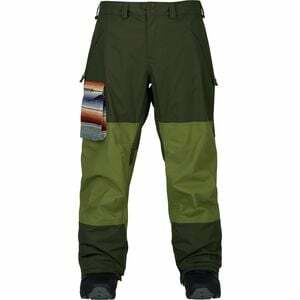 Additionally, Burton hooked the Covert up with hand and cargo pockets to keep you organized, and finished it off with reinforced cuffs, ankle zips, and cuff elevators that prevent your hems from getting tattered.